Saskia Machaczek is riding up the Andes! German Equestrian Explorer Saskia Machaczek is riding up through the Andes. She and Philippe Rustenholz started out together, but they decided to go their separate ways. They realised that their ideas about horseback travel were too far apart. "I am well and making the most of my freedom, my free time, my life. I am very much aware of this opportunity, and I try to live each minute, to make the most of each moment." 15th June 2002 - THE END! 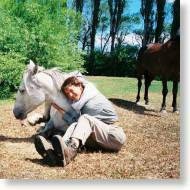 Saskia has sent The Long Riders' Guild her last email of her journey. "After spending a Bavarian weekend in Patagonia with Eberhard and Teresa, who are of German descent, I worry about my four-legged friends. It is snowing more and more heavily, and I want to remove their shoes as soon as possible. Snow clings in the shoes, forming ice-balls as big as tennis-balls. My hosts would have loved to have had that crazy Hamburg girl to stay a little longer, but they understood my concerns about the horses. When I got back to the farm I hurried through deep snow to the horses. Luna, being a white horse, was almost invisible in a snowy landscape, but to my great joy both horses trotted towards me. The next day I took their shoes off. Repollito, who at the start of our journey had to be hobbled before we could pick up his hind leg, gives me no problem nowadays. I wept while I saddled the horses for the last time, and set off in the snow. The gate between the two estancias was supposed to be left open for me, but I found it firmly locked, with nobody around and no sign of a key anywhere. Well, we’d done it before – I slackened the fence, laid it down on the ground, and the horses stepped carefully over it. What champions! Tyre prints in the snow reveal that two days ago a vehicle was here which must have gone from somewhere to a farm. The sun shines brightly and I savour indescribably beautiful views, but an icy cold wind bites my face. On my map I find El Palithue farm and reach there in the course of afternoon. And after Bavaria I now feel like I am in France. A vintage 1991 Red, Champagne, and Roquetta salad for dinner with candle light. My guardian angel certainly has guided me this way, for the correct way would have led up to Los Helechos. My journey is extended by one day. On my last day, in spite of being repeatedly assured that the gates at the puesto between El Palithue and Los Helechos will be unlocked for me, I found the puesto empty except for a pack of dogs. They snarled and barked at us, terrifying me half to death. It took me nearly an hour to find a weak spot in the fence and get back to the track. It was snowing so hard that I could hardly see Repollito’s ears, and getting dark rapidly. But then a car passed – it was one of the guys who works at Los Helechos! Wonderful, I thought, they now know I’m on the way. A little while later three small cars came charging past from behind. Repollito freaks out at these monsters appearing suddenly from the nothing of a white snow-wall, and jumps down the slope, followed by Luna. Oh please, let us not have an accident in the last hour of our journey. An hour and a half later I reached my goal, and put the horses into a dry barn with hay before turning them out into the paddock. A few days later it is time to leave. I go back to the paddock for the last time to caress my horses. It is snowing hard again. I am alone with my horses and allow the tears to flow. This is for me the best way to release my grief, and I am consoled by the fact that my companions are in good hands, free to roam in this enormous field with other equine friends. What a wonderful journey and an amazing experience. Saskia's earlier emails can be found here. For more pictures, please visit www.thecourtot.com/argentina.